I was a little shocked when I walked into a Lowe’s Home Improvement store in mid-October and saw the Christmas display. I had several reactions, including a sense of panic about where the year had gone. Did I enjoy summer? Do I need to start thinking about New Year’s resolutions? Where are the paintbrushes? Will my daughter and I get her room painted in the time we set aside?! I was reminded of that all-too-familiar feeling of too many tasks to accomplish while balancing the need to focus thoughtfully and strategically on one thing at a time. 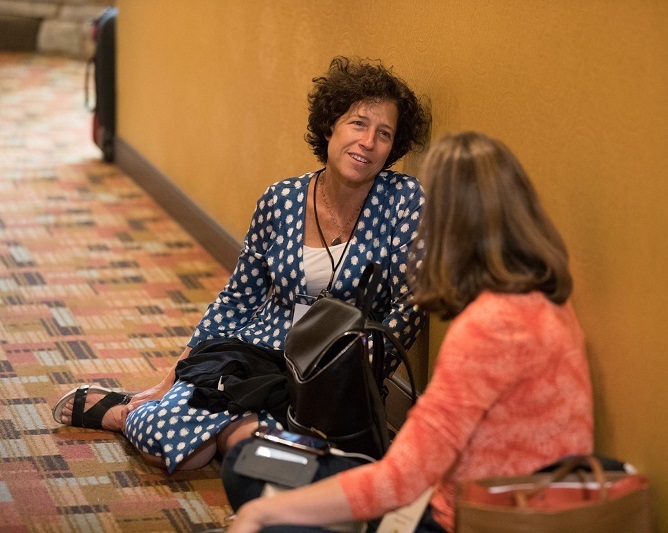 If you came to Philanthropy Northwest’s 2016 conference or have been reading our blog, then no doubt you have heard about Philanthropy’s Reflective Practices. This project aims to share tools and skills that can help philanthropy practitioners — in any role at a family fund, foundation or corporate giving program — take up their leadership in more impactful ways. These practices encompass research findings from other fields, as well as interviews with foundation leaders and program officers about the challenges we face in managing our busy, deadline-driven, professional and personal lives while still trying to create honest, productive and authentic relationships with colleagues and grantees. This project is not about meditation, deep breathing or mindfulness (although it can include those, too) — it’s about the discipline we need to learn or sharpen so that we are better at our work and better partners for our communities. At Philanthropy Northwest’s conference, we built time into our sessions for reflective practices, asking participants to take stock of their learning journeys by asking ourselves: what did we learn, what did we observe about our own participation or reactions, how do we bring this back home? Obviously, the conference isn’t a Lowe’s — but we had a lot of information to take in, on topics where emotions run deep, prompting a range of responses and experiences that shape our views of what philanthropy could do to reinforce community democracy and racial equity. We thought it was the perfect time to introduce reflective practices to continually ask ourselves what was happening, why was it important and what did it make us think about our own next steps. Taking a few minutes to reflect during Philanthropy Northwest's 2016 conference. Our experiment was met with mixed reactions. Some participants said it was useful to slow down; others shared that it felt awkward. We were pleased to hear that after the conference, Sherwood Trust's board members used our deck of Visual Explorer cards to reflect with each other on what they had taken away from the three days together. But this kind of reflection does not come easily to everyone, and the specific structures we offered at the conference are not right for everyone. There are many ways to incorporate reflective practices into our philanthropy work. They can help you focus when you are asked to take a drink from a fire hose, feeling overwhelmed and inundated with responsibilities. Take a look through Philanthropy’s Reflective Practices website at the stories and interviews from others who have found that changing their listening skills (so they listen better or talk less), looking at an interaction from the balcony rather than being immediately reactive when things are tense. After 20 years in the nonprofit and philanthropy sector, I know that the pace and fullness of how we work can be detrimental — sometimes to our relationships, sometimes to ourselves and often to our desired outcomes. My current practice is to set aside 10 minutes every week to review meetings and interactions, not just to make my next to-do list, but to highlight what I’ve learned and which people I need to circle back around with to close out a conversation where an idea is lingering or an interaction felt uncomfortable. As we have incorporated reflective practices into our work at Philanthropy Northwest — for example, our team retreats now include more time for reflection alone, in pairs and all together — and into our client engagements through The Giving Practice, we are reminded that it’s not just about getting work done, but doing it with meaning. Moving into the holiday season and end-of-year, there’s no better time to upgrade your reflective practice skills: Get everything done, but do it with meaning! Spend a few minutes on our website and find an idea that might help you manage the challenges ahead — or share a strategy you already use. The best part of my job is that I am reminded each day of the incredible devotion and enthusiasm each of you have for your work. I hope to hear from you about your reflective practice — what works and what needs work. We’re listening. Audrey Haberman is interim CEO of Philanthropy Northwest and managing partner of The Giving Practice, our national consulting team. She can be reached at ahaberman@philanthropynw.org.